BNA Board Statement on Cannabis Dispensary at 207 N. Bridgeton Rd. Nathaniel Werner is the Marijuana Code Compliance Officer for the Portland Office of Neighborhood Involvement. I spoke to him yesterday (Thursday) to confirm his attendance at our general meeting on April 17. He informed me that earlier this week, La Mota LLC resubmitted their application to establish a marijuana dispensary at 207 N. Bridgeton Rd. the site previously occupied by The Channel’s Edge. Mr. Werner has confirmed his attendance, and has offered to invite the owner of La Mota to join us to answer questions. The Meeting will take place at the Portland Yacht Club, 1241 NE Marine Dr. Doors open at 6:15, and the meeting will begin at 6:45. We have several other invited guests who are scheduled to present on the 40 Mile Loop Trail, MCDD Levee Ready Columbia, and Cleaner Air Oregon. These are significant topics for the neighborhood, and we look forward to hearing about their projects. The Board has expanded the time allotted to ONI and the dispensary conversation to 40 minutes, from 7:50 - 8:30 adjournment. Please recognize that this isn’t much time, and will probably leave many questions unaddressed. As we know from February’s experience, this is a hot-button topic, so discipline and social courtesy will be required. We look forward to a productive meeting next week. The Bridgeton Neighborhood Association in concert with PBOT and our neighboring communities has worked to reduce average speed along Marine Drive and improve safety. One of the steps to calm traffic is to install a Speed Camera to ticket drivers exceeding the speed limit. This ever vigilant policeman will take a photograph of any vehicle exceeding the speed limit and issue citations to owner of the vehicle. A police officer is not required to be present to write the traffic citation and judges find the evidence to be compelling. Fixed speed safety cameras planned along NE Marine Drive near NE 33rd Drive and NE 138th Avenue as part of Vision Zero will be installed this month (January 2018). The safety camera near NE 33rd Drive will enforce the eastbound traffic along NE Marine Drive; whereas the safety camera near NE 138th Avenue will enforce the westbound traffic along NE Marine Drive. A speed reader board, speed limit sign and TRAFFIC LAWS PHOTO ENFORCED sign are posted in advance of each fixed speed safety camera system. Once the cameras are activated, there is a 30-day warning period during which warning letters are mailed to those who receive a notice of speed violation. Thereafter, citations will be mailed. Above illustration (2017 safety projects): The arrows point out the respective general locations of each camera system and speed reader board assembly. Why is the Portland Bureau of Transportation (PBOT) doing this? Speeding is a top contributing factor to deadly crashes across the Portland region.Traveling at excessive speeds has been consistently linked to higher crash risks. The faster people drive, the longer it takes them to recognize a dangerous situation and to bring their vehicle to a stop once they have hit the brakes. The Vision Zero action item for speed includes a speed safety cameras pilot. The pilot encompasses four high crash corridors in the first two years (and to expand the program after the pilot). The first three fixed speed safety cameras are currently operating along Southwest Beaverton-Hillsdale Highway, SE 122nd Avenue and SE Division Street. The Bridgeton Neighborhood Association welcomes community involvement particularly when it involves public safety. If you have any suggestions on how to improve traffic safety in our neighborhood or would like to get involved in other traffic related issues, please contact Erik Molander, Chair, Land Use Committee. The next meeting of the Land Use Committee is scheduled for Monday February 5th at 6PM at the Marriott Courtyard 1231 N. Anchor Way Portland OR. We welcome your input and involvement. Neighbors along Bridgeton Road and Anchor Way are asked to host house parties in order to share information about new curbside recycling, energy savings and waste reduction. 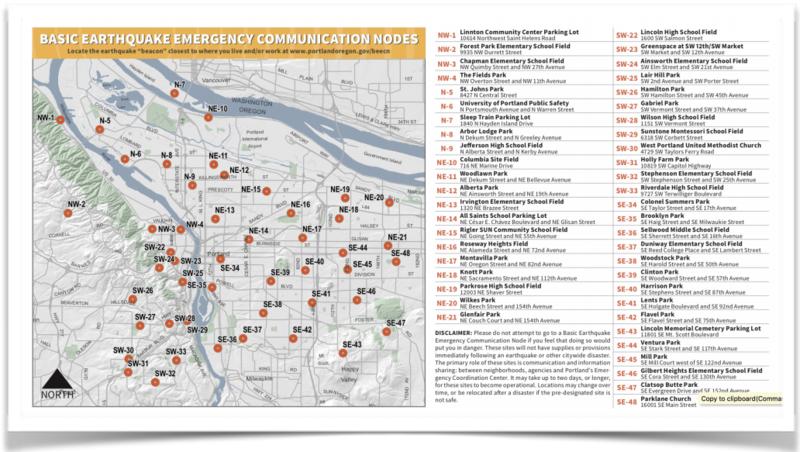 Plus find out about the Neighborhood Emergency Team (NET) resources in our own neighborhood about what to do, and where to go, if (or when) an earthquake or any other emergency strikes. No more searching online or reading countless emails only to find outdated answers. Attending a party at your neighbor’s homes will get you up to date in a relaxed setting. Get the skinny on new recycling programs in the City of Portland, Metro’s find a recycler, reuse and refined products plus lifestyle choices to eliminate having as much garbage in the first place. Property owners will learn ways to contain trashcans and increase safety in containment areas. “Are you sick of looking at trash along our roads? Did you know there is a new curbside recycling, energy saving and a waste reduction program? Do you know what to do if we have a cellphone alert to announce a missile, an earthquake, a fire, a flood? Me either. The Bridgeton Road Green Team is organizing house parties (not that kind) to share information about all of the above. This will be a great time to learn some important and easy steps that we can take immediately to help our beautiful neighborhood,." - Laura Miller, BNA Green Team member. BNA House Party hosts are wanted throughout the Bridgeton Neighborhood, in houses, apartments, town homes or floating homes. Contact Bridget Bayer to find out more about scheduling one in your home this Spring. The public is invited to share their experiences with congestion and views on congestion pricing at three upcoming open houses. The one in Multnomah County will be at the Lloyd Center on Jan. 27. Congestion pricing, also known as value pricing or variable rate tolling, refers to tolling options that are specifically designed to improve traffic flow. Congestion pricing systems charge higher prices for driving on a road when demand is greater, in the morning and evening rush hours, for example. Some drivers choose to travel on other routes, at different times of the day or on other modes of transportation. 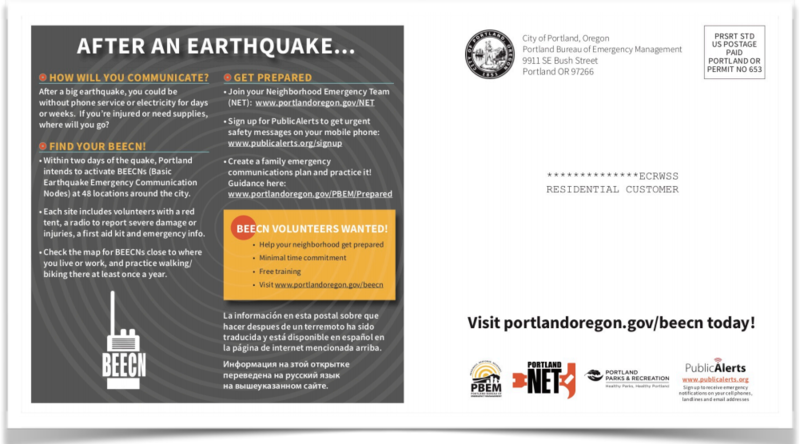 Saturday, Jan. 27, 10 a.m. to 1 p.m.
Portland is looking for neighborhood volunteers who can staff the local BEECN site during an emergency. Training for the program requires attendance at a 90 minute presentation, which the city hosts on a regular basis, or, we as a neighborhood can set a time and place and the city will bring the training to us. If you are interested in attending a training session in the neighborhood please fill out the form. Thanks.